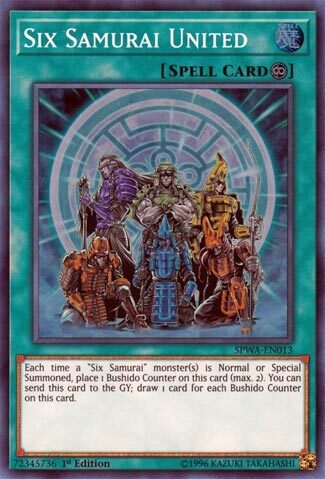 Each time a “Six Samurai” monster(s) is Normal or Special Summoned, place 1 Bushido Counter on this card (max. 2). You can send this card to the GY; draw 1 card for each Bushido Counter on this card. Six Samurai United was one of the original draw powers of the deck. Easy to use, a Continuous Spell, max of two counters, pop to draw. Get a counter each time a Six Samurai was Normal or Special Summoned…too easy. This card was a blessing to see in the first hand, and at 3 there were times where you could get 2 in the opening hand with a way to benefit immediately from the draw power. You almost always got 2 off of this card, and you wanted to burn through these quickly to get to your resources. It was slow-going when first released, having no access to Kizan, but once the second batch of Six Samurai got released it was off to the races. Kageki into Kagemusha was the standard play, but Elder and Kizan added more firepower. Mizuho and Shinai could Special Summon each other, and Aestheticism of The Six Samurai solidified this cards power. Not even going to get into moving the counters from another card to this one, or how Gateway can combo with this card to remove off this card for its own effect(s). Small beginnings for this draw power, but you still were able to capitalize on getting two counters. It got better as time went on and remains a staple in 3’s in the deck. Draw Cards are almost always good. Six Samurai United is a Continuous Spell Card that almost always lets you draw 2 cards. After this is activated, anytime you Normal or Special Summon a Six Samurai monster, you get to place a Bushido Counter on this card. Then you can send Six Samurai United to the grave with a max of 2 counters to draw 2 cards. There is no once per turn on the draw effect, so that is the main reason to multiples. Gateway makes the whole deck live again, this continues to make it work. A throwback today to another Six Samurai Spell card, only this one is actually good, Six Samurai United, which is sad considering Six Samurai got better Spells in 2008 and 2009 (in this card and Gateway of the Six) than they did in 2017 (Secret Skills). Six Samurai United is a Continuous Spell that gains 1 Bushido Counter when you summon a Six Samurai monster. This was really easy with the Legendary Six Samurais with Kaigeki and Kizan. Add that with Grandmaster of the Six Samurai and there is no reason this card shouldn’t be live immediately after you activate it. This card has a max of 2 counters, which helped balance the later Gateway of the Six so you couldn’t just stack counters on this and Gateway, but clearly that didn’t matter in the end as Gateway got banned anyways. If you want to use United for what it does, you can send it to the GY to draw a card per Bushido Counter. Another reason why the max of 2 counters matters, so you can’t spam Six Samurai monsters with the help of Gateway and then draw 10 cards. Still, this card is really good and most to all Six Samurai builds play it, especially with Gateway back to 1 and with the chances it comes back to 3 like the OCG.